Wunsch entspreche ich nach Rücksprache mit Uwe Süßenberger, Moderator. 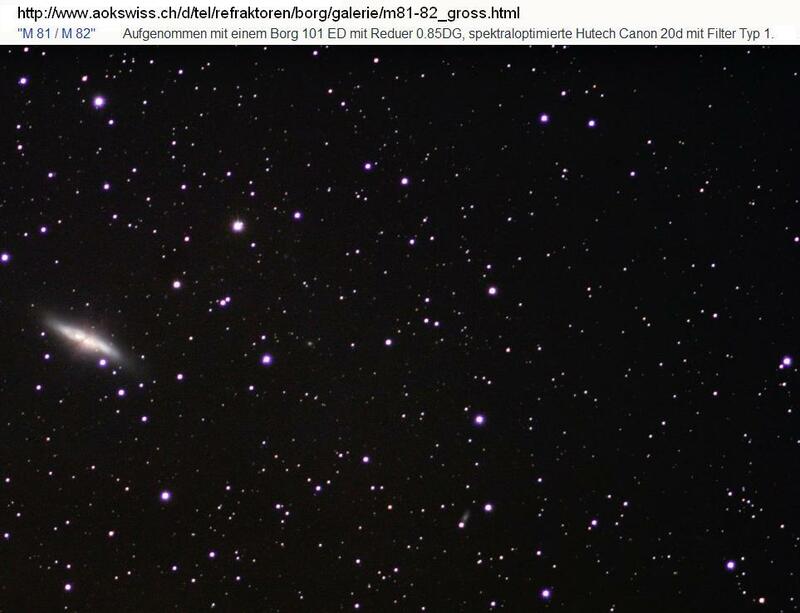 Im Übrigen deckt sich meine Untersuchung mit dieser Aufnahme: von AstroOptik Kohler ins Web gestellte Bild bzw. man es im Ernstfall nicht auf den Borg ED beziehen kann. kegel des ÖffnungsVerhältnisses assymptodisch annähert. entspricht und dessen kurze Seite dem halben Airy-Scheibchen-Durchmesser entspricht. Fernrohrs nicht schärfer fokussiert werden kann. wie Unterkorrektur, die ebenfalls zu einer "M" oder "W"-förmigen Verformung führen. Hier gilt die Regel, Rand-Mitte-Rand müssen auf einer Geraden durch die Mitte liegen. Zahl von ca. 0.9 und man hätte keinen Rotsaum. The post was edited 12 times, last by Rohr ( Jun 30th 2009 ). First, I have to express my thanks regarding your optical measurements, which are the most excellent and valuable that an amateur astronomer can find over Internet. 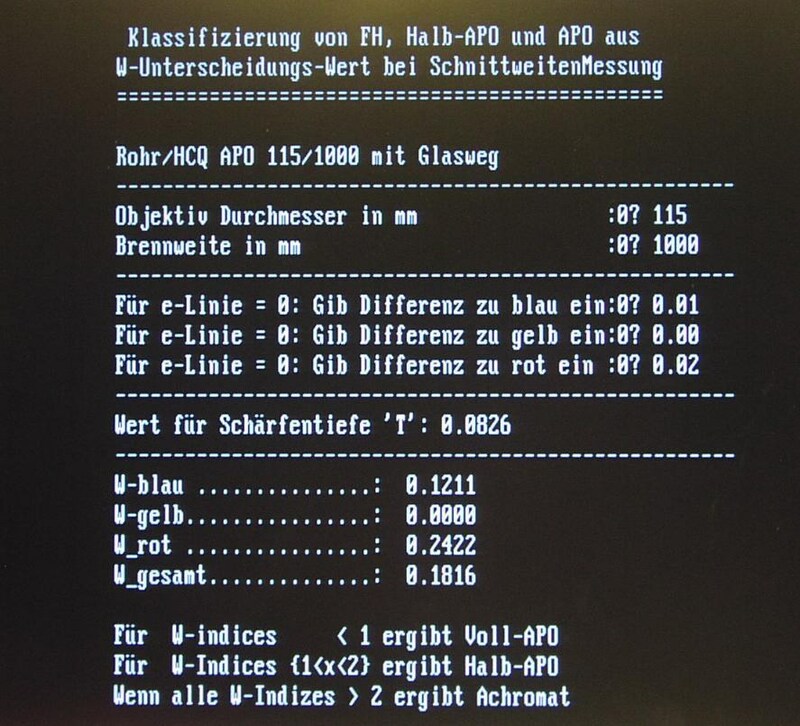 I believe there would be an even better method for evaluating the final results of your measurements in the case of APO lenses. At this moment you use methods that are based on measuring the focal position differences in different colors, and this method can really correctly measure the false color of lenses IF the main source of the false color of the lens is the longitudinal false color (i.e. the focal length of the lens DOES differ at different wavelengths) and the lens has minimal spherochromatism. 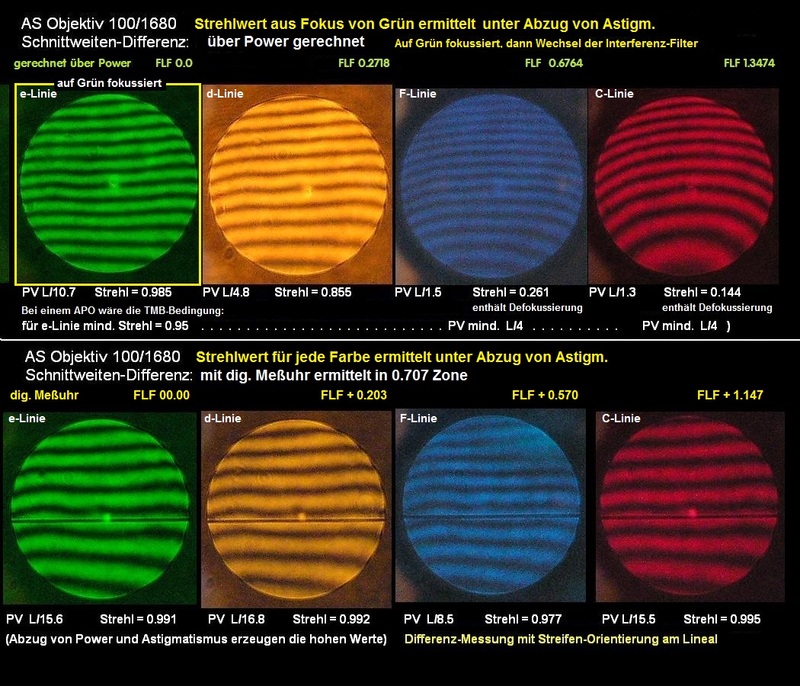 But this method has a problem when evaluating real APO lenses: if the lens has identical focal positions at every colour, but the lens has significant spherochromatism, then the calculated false color index of the lens might be excellent, still, the lens will not be color free under the stars, because spherochromatism will smear out some blue and red light from the Airy disk. 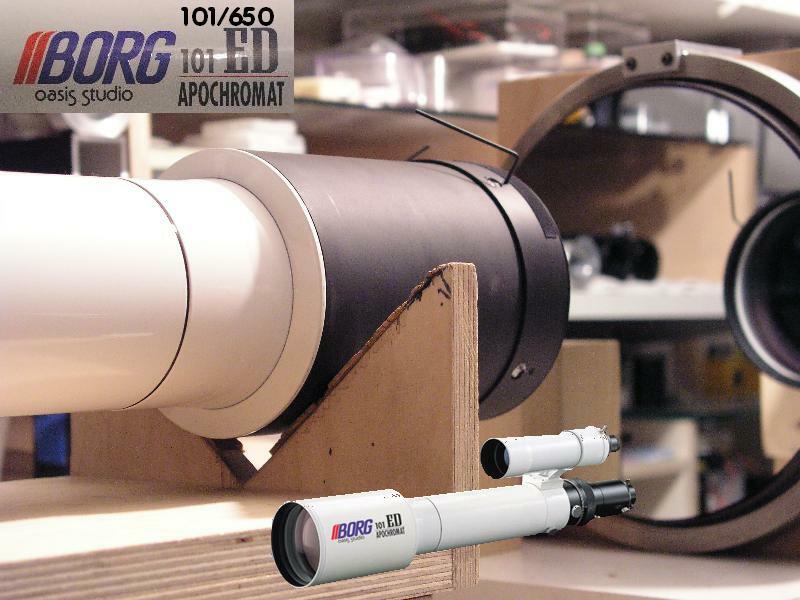 For this reason, I recommend using your current method only for measuring achromats and semi-APOs, but, if this measurement proves that the lens is a real APO, then I recommend another measurement method. Using your interferometer, you could set the green focus, and then change color filters and DIRECTLY measure the Strehl ratios in blue, orange and red colors (by photographing the interferograms of these colors and WITHOUT changing the focus positions between different colors and evaluating the resulting fringe images). This would give much more realistic results for actual apochromatic lenses, featuring some spherochromatism. I.e. if the lens has significant spherochromatism, then the Strehl ratios in blue and red will be lower than for a lens with less spherochromatism, and the results will better match the results of actual observations under the stars. I believe the main reason why someone buys/makes an APO is to have a scope that concentrates most light energy in the Airy disk, and this is NOT ONLY true in green color, but remains true in other parts of the visible spectrum too. Why don't we measure this directly? If we analize the above set of conditions, we can see that they take care of our actual expectations. And this definition is better in the mathematical meaning, because it does not contain "empty" statements, i.e. statements that are direct results of the others. And at the same time, it contains ONLY conditions that can be DIRECTLY MEASURED, so, it is not only a theoretical definition, but also it can be well used in practice. I believe using this definition would be advantageous in many respects. Mr. Rohr, I am really interested in your opinion! distinguish, what an achromatic, a half apochromatic and what a normal or what a super apochromatic system is. with 546.1 nm wave should be perfect oder better than Strehl = 0.95.
the apochromatic lenses from the half one or at last from the achromatic one. the upper interferograms are measured by the micron dial gauge in the 0.707 zone. you just insert another interference filter and calculate the Strehl, as your report shows. Normally you fix the focus for the green color. but red in this case a worst Strehl of perhaps 0.20 ? With my method I take the arithmetic middle of red and blue and compare it with the main color green. spectrum. If the focus blue = red, then yellow has the longest focus and it would be an apochromatic lens. lens. But nobody do so. Yes, you are absolutely right! The method I recommend is NOT a general method, while your method IS generial. Your method CAN be used to categorize ALL lens types (APOs, semi-APOs and Achromats) and it is IDEAL for this task. My method can be used ONLY to COMPARE REAL APOCHROMATS, because it will reliably indicate "how good APOs" they are, but it CAN NOT BE USED for achromats or semiAPOs. But hopefully, the future will bring more and more real APOs to your laboratory (and I hope less scopes that are only sold as "APO" but perform only as a semiAPO), and this way, measuring and comparing those real apochromats is expected to be a most regular activity in the future. In my opinion this makes it necessary to re-think whether or not the method used in the past can or can not (?) be used to COMPARE real apochromats? Theoretically, maybe we should look back and see why both Abbe, and Mr. Thomas Back required 3 intersections of the color curves (i.e. "3 widely spaced wavelenghts with identical focal lengths") in their APO definitions? 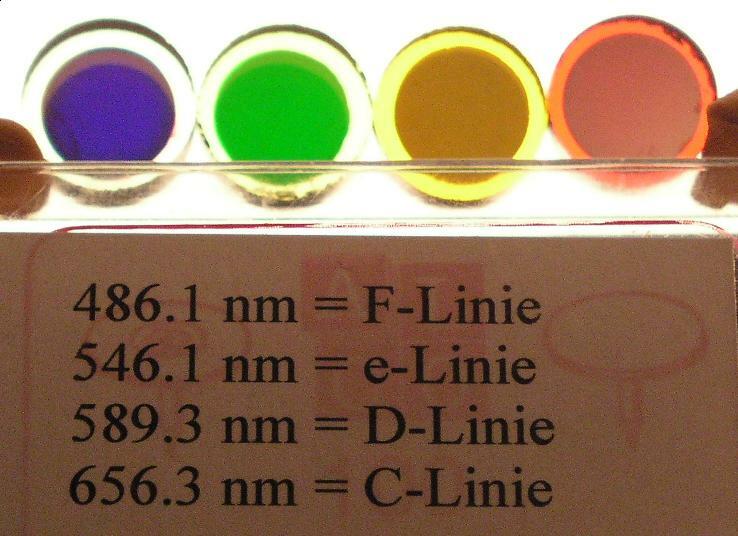 The reason is simple: if a lens system has 3 widely spaced wavelengths with identical focal lengths, then this system can have only NEGLIGIBLE amount of longitudinal false color (because there is no glass that would change its refaction index suddenly e.g. from 550nm to 560nm). So, their criteria of "3 wavelengths with identical focal length" is practically EQUIVALENT to the criteria "system with very small longitudinal false color". As today we can use special dispersion glasses in the lenses, we can easily fulfill this criteria but this comes at a price: the Abbe numbers of the glasses used in the APO lenses will have LESS differences than the typical ratio of 2:1 in standard achromats, so, the internal curves will be MUCH stronger and this will increase spherochromatism. So, removing the longitudinal false color brings spherochromatism in the picture, and the best method to decrease it (and keep other parameters constant) if we distribute the stronger curves on the two surfaces of the special dispersion glass member. So, today we drop the good old doublet APO lenses and design triplet lenses instead, with the fluorite in the middle. This decreases spherochromatism, and a well designed triplet lenses will in fact deliver images with better color correction than similar doublets. 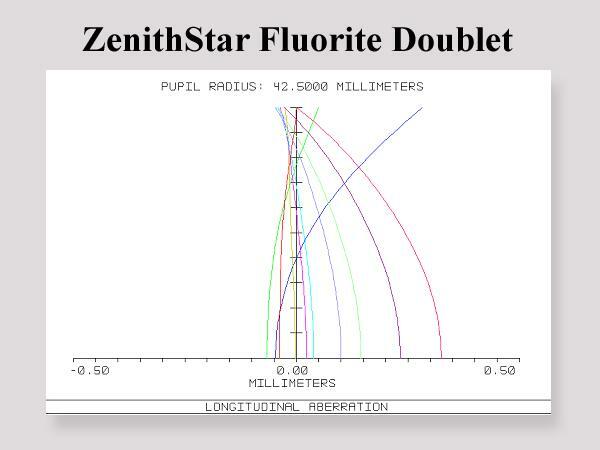 But unfortunately, if you use your current method to compare apochromats based on their false colour index (that you calculate from the focal position measurements), it will show ZERO DIFFERENCE between a doublet and a triplet APO built using similar glasses. The reason is simple: replacing a doublet with a triplet significantly decreases spherochromatism, but it DOES NOT decrease the longitudinal false color (this is why achromatic triplets are NOT commonly produced). So even if triplets ARE BETTER lenses under the sky, but they WILL NOT GIVE BETTER RESULTS in your current measuring method (we have just proved this theoretically :-). This is why measuring the longitudinal false color of the Takahashi FS 102 gave better false color index than measuring a 100/800 TMB, while I believe the TMB has MUCH less false color under the sky. 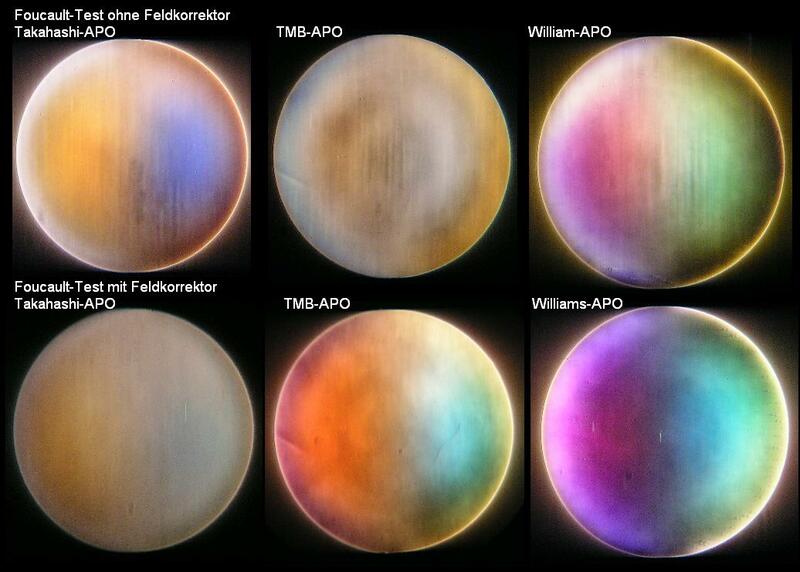 I used to own several TMB triplets and ALL of them was free of any visible false color, while owners of Takahashi FS series telescopes usually see some false color in focus when they observe e.g. Vega at high magnifications. It is still possible that you measured exceptionally good Takahashis and exceptionally bad TMBs, but I do not believe this would be realistic. The obvious reason is that you used a method that can NOT detect the improvement of a triplet APO compared to a doublet APO. I believe the ideal method to compare apochromats MUST reflect the improved color correction of triplets (i.e. their decreased spherochromatism) compared to doublets, because under the sky, this IS a significant difference. And measuring the Strehl ratos of the blue and red colors in the green focus is the method that will measure the final ability of the lens to focus different colors into the Airy disk. So, I recommend using your current method as the FIRST test when doing the CLASSIFICATION of a lens (APO <-> SemiAP <-> achromat), and it is correct to use the calculated false color index for comparing achromats and semiAPOs. But, if your classification proves that the lens is a REAL APO, then you should do the direct measuring of the Strehl ratios at the second step, and compare APOs based on THIS PARAMETER. This will reliably tell "how good" is an apochromat, and the results will match the actual observations (i.e. amount of observed false color in the eyepiece). > ED Apochromat. Is it an apochromatic system or not? 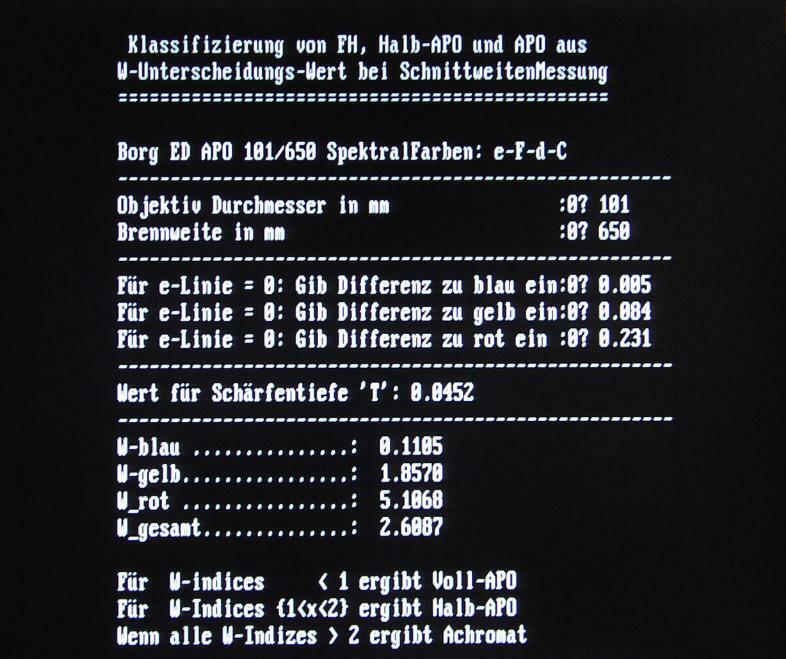 We totally agree in this: the Borg is clearly NOT an apochromatic system, so, you MUST use your current method when measuring this lens and it will give correct results (because the main aberration of the Borg is the longitudinal false color, i.e. the focal length in red is different, so, at BEST we can classify it as a semiAPO). We can NOT use my method with this lens, as this is not an APO. I was happy to see that in some cases you did make interferograms of different colors in the common (green) focus, I believe this was the case for the Zeiss APQ 100/640 too. 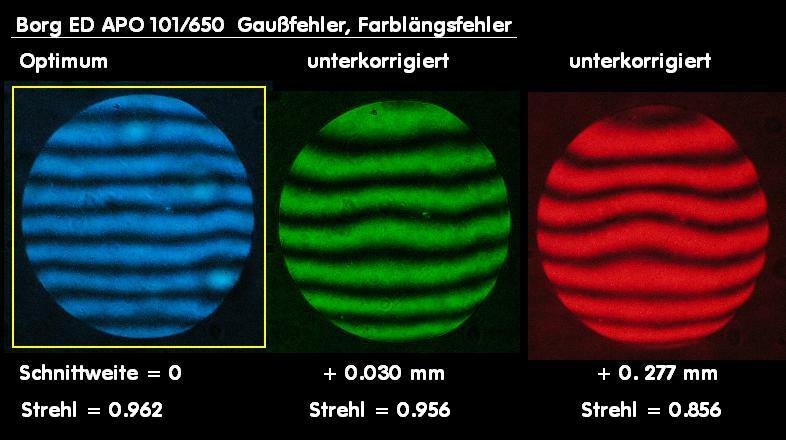 I did calculate the Strehl ratios for that scope based on your interference images, and the results were around 90% Strehl for both blue and red, so, THAT lens is a really excellent apochromat. But you are right, you can NOT do this for either the Scopos 80/560 or the Borg, because these are not even near to being a real apochromats. Sorry, this method can be used ONLY for real APOs, where the lens is at least near to match the APO definition. For all other lenses, your current method is the correct one. I believe is that the key is to use these two measuring methods TOGETHER, because NONE OF THEM can measure and compare all types of lenses correctly. Your method is excellent for classification and for comparing achromats and semiAPOs, while the other method is best suited for comparing real APOs. > lens. But nobody do so. This is true. But a 65mm real APO will show less of the sky than a 101mm, so, masking it down will not help much. 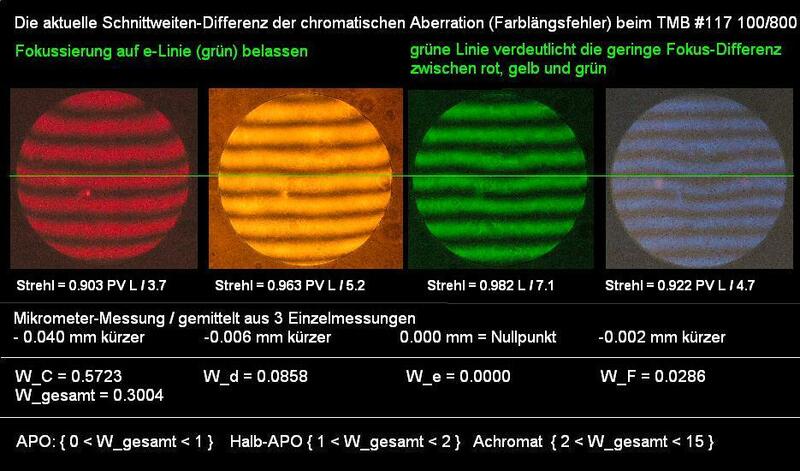 First, about comparing the measurement methods with the masked down Borg: with the mask, the false color will decrease, and the lens might be able to fulfill the APO definition. 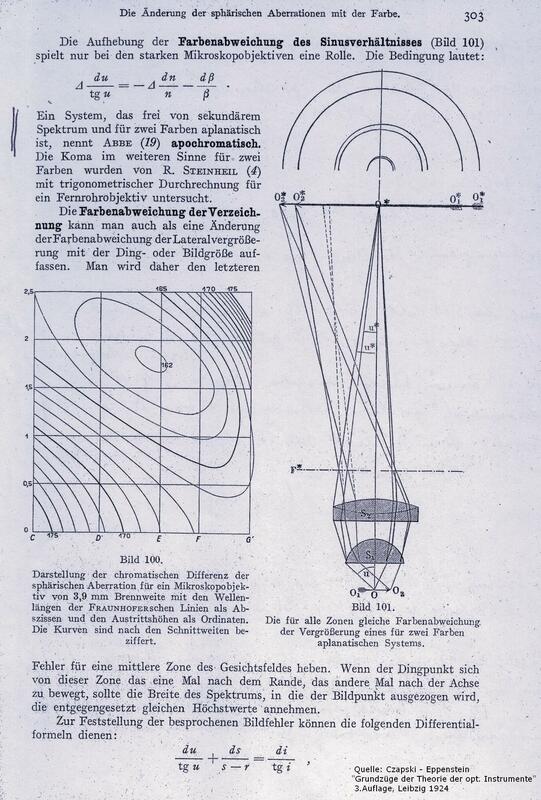 But your measurements will also give better numbers for the Borg with decreased aperture, because the angle of the light cone will decrease, this will increase the depth sharpness, and your calculations will give better color index results for the lens, even if the focal length positions of blue and red do NOT change actually. My method will also give better results, so, BOTH methods will measure the improved color correction of the Borg with smaller aperture, there is no difference in this respect! But this would not be when masking down a real APO!!! Achromats (and semiAPOs) have significant longitudinal false color, so, their false color is produced mainly by the edge area of the lens. So, for these lenses, decreasing aperture will increase the measured Strehl ratio in blue and red, and also your method will give better results after masking them down (and in reality, masking improves the color fidelity for them). 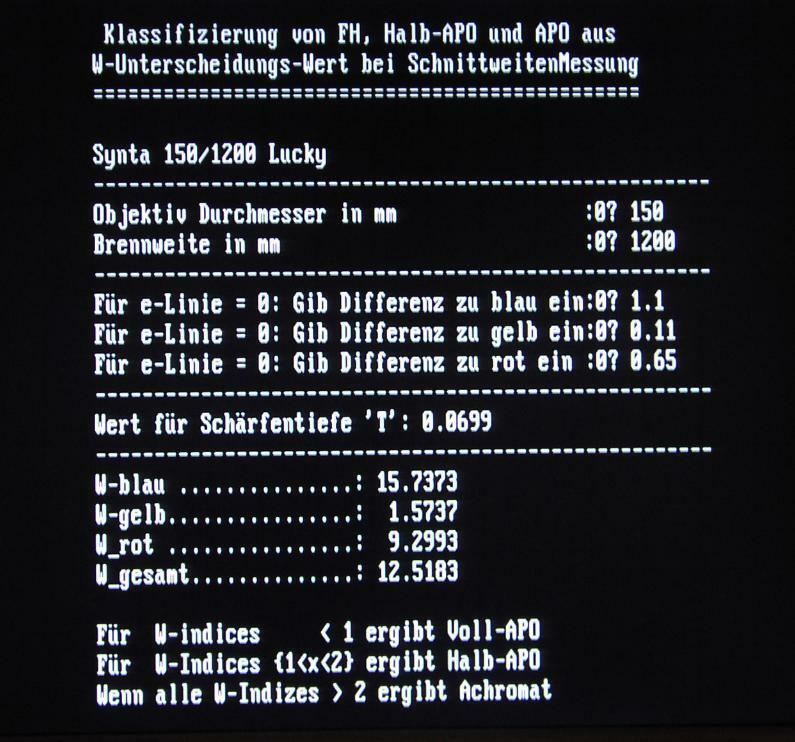 But real APOs will work differently (and this is a direct result of their spherochromatism): if a real APO is well designed and well built, then masking it down to smaller aperture will actually DECREASE the Strehl in blue and red (because their edge area gives the best image in blue and red). So, even if this is really surprising, but masking down a real APO will actually INCREASE the amount of false color slightly. So, this masking trick works with the Borg (because it is a semi-APO), but will NOT work with a TMB (or another real APO). das die Borg-Apos nicht "apochromatisch" sind kann man schon beim Duchgucken auf den ersten Blick erkennen. Hatte bisher Gelegenheit den 3-Zöller und den 4-Zöller mehrmals zu benutzen (gehören einem Sternfreund) und konnte sofort festellen, daß die Farbkorrektur keinen großen Stellenwert hat. 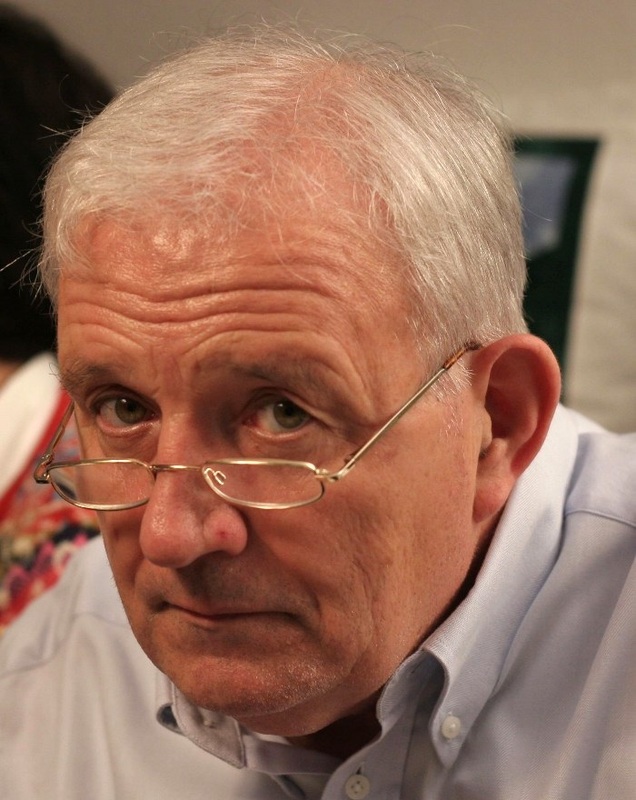 Ich denke es liegt darin, daß diese Geräte von Anfang an für die Fotografie gedacht waren, und das zu einer Zeit, als in der Fotografie die Farbkorrektur noch keine so große Rolle gespielt hat wie sie es heute tut. Leider hat der 3-Zöller meines Freundes auch noch heftigen Astigmatismus. Der Grund war leicht auszumachen, eine zu großzügig geratene Objektivfassung. Visuell würde ich daher die Borg-Refraktoren nur mit Vorbehalt empfehlen. Es gibt für deutlich weniger Geld andere Marken, die mehr zufriedenstellen. stelle. Stattdessen bekomme ich den Eindruck, daß der betroffene Kunde "ausgehungert" werden soll. pisch für einen Refraktor ist auch der Gaußfehler: Das Optimum sollte bei 550 nm wave liegen, also der max. 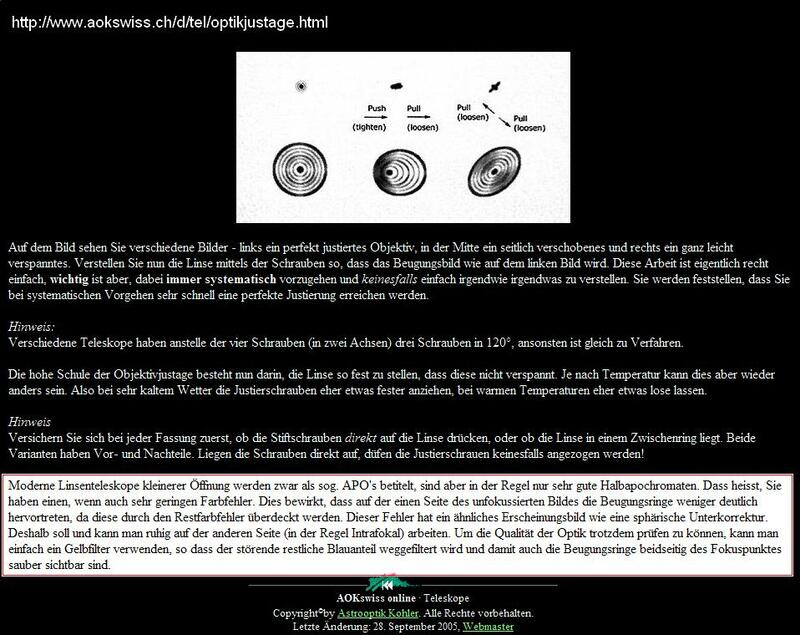 <B><BIG>W</BIG></B>illkommen bei AOKswiss online, dem WWW-Informationsservice von Astro Optik Kohler. Wir verzichten ganz bewusst auf Seiten mit "Einkaufskorb", sondern setzen auf sicher ladende html-Seiten ohne Cookies, die dafür eine Fülle von Informationen enthalten, sowie der aktuellen Preisliste mit dem möglichst aktuellen Angaben über den Lagerbestand. Und nicht zuletzt setzen wir auf persönliche Beratung vor mehr Umsatz! Die letzen grossen Änderungen und Neuheiten sind in der Regel auf dieser Startseite vermerkt oder finden Sie auch auf der Preisliste. Die Menüleiste zu Ihrer Linken wird Ihnen helfen, durch unsere Seiten zu stöbern. Kleine Bilder mit geringer Auflösung zeigen meist auf grössere mit höherer Auflösung und weiterer Information. Dies hilft, die Übersicht einer Seite zu verbessern. Enjoy it! am echten Stern sehe, einigermaßen decken, was meiner Meinung nach im Moment nicht ganz der Fall ist? "This is why measuring the longitudinal false color of the Takahashi FS 102 gave better false color index than measuring a 100/800 TMB, while I believe the TMB has MUCH less false color under the sky." noch relativ leicht Farbe wahrnehme (bin außer ein Dobsonbauer auch ein sehr kritischer APO-Liebhaber, wie du weißt) während sich das beim TMB schon schwieriger gestaltet. eine erste allgemeine Antwort, der zweite Teil kommt in einem weiteren Megrez-Bericht: Die "Entwickung" meiner Meßtechnik ist letztlich eine Frage der Mentalität. Während sich andere herumschlugen mit der Genauigkeit, mit der der Bath-Interferometer messen kann, verloren sie zunächst erst einmal aus den Augen, wie genau man überhaupt messen kann unter Verwendung der herkömmlichen Interferometer + Auswertung der damit erzielten Streifenbilder. Das wäre überhaupt die interessantere Frage. Ein weiteres Prinzip besteht darin, den Bath-Interferometer nach seinen grundsätzlichen Möglichkeiten abzuklopfen: Das interferometrische Messen im gesamten visuellen Spektrum. 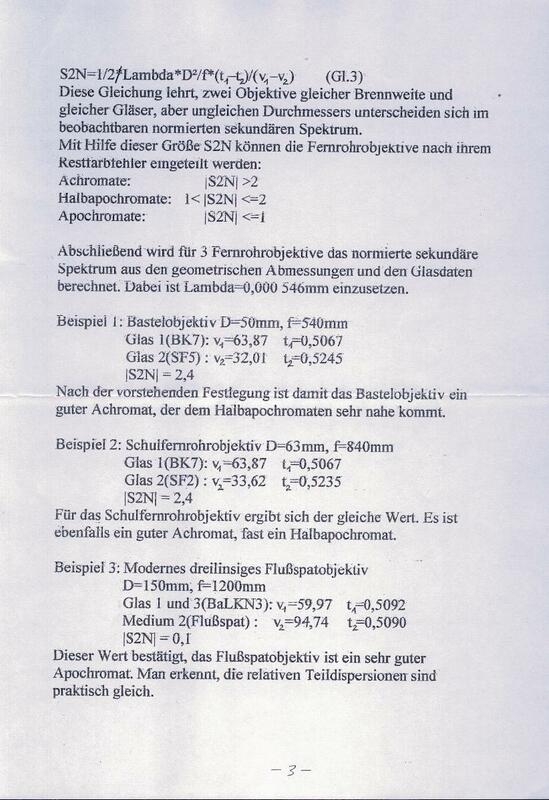 Damit kann man den Gauß-Fehler wunderbar quantifizieren, des sekundäre Spektrum messen und hat eine Klassifizierung der Refraktor-Typen. Während manche ihre Energie in nutzlose Auseinandersetzungen investieren, habe ich viel Spaß an meinem Hobby mit dem starken Bedürfnis, immer neu dazuzulernen. Es gibt noch so viel, was ich noch nicht weiß. Der Hintergrund zu diesem Thread ist eine wahre Geschichte. Moderne Linsenteleskope kleinerer Öffnung werden zwar als sog. APO's betitelt, sind aber in der Regel nur sehr gute Halbapochromaten. Dass heisst, Sie haben einen, wenn auch sehr geringen Farbfehler. ... dieser Refraktor keinesfalls ein Voll-Apochromat ist, nach meinen Messungen noch nicht einmal ein Halb-Apochromat. Der Sternfreund gibt das Teleskop zurück. Wegen der von mir festgestellten Mängel, die der Händler in einem Email auch noch bestätigt. Mit gleichen Atmenzug verlangt er aber zugleich, daß ich meinen Bericht zurückziehen soll, damit er das Teleskop weiter veräußern kann und durch meine Berichte nicht gestört wird. In der Folge wird mir von mehreren Seiten, z.B. von BinoTom, bestätigt, wie der Borg ED einzuschätzen ist, siehe weiter oben. Es gäbe noch noch viel zu erzählen, aber die Sache wird vermutlich über Anwalt weiterlaufen. Dabei ließe sich das ganz geräuschlos und kundenfreundlich lösen. Der Händler jedenfalls hat sich einen BärenDienst erwiesen. Das was Pal Gyulai geschrieben hat, sehe ich genauso und habe es auch schon einmal hier diskutiert! 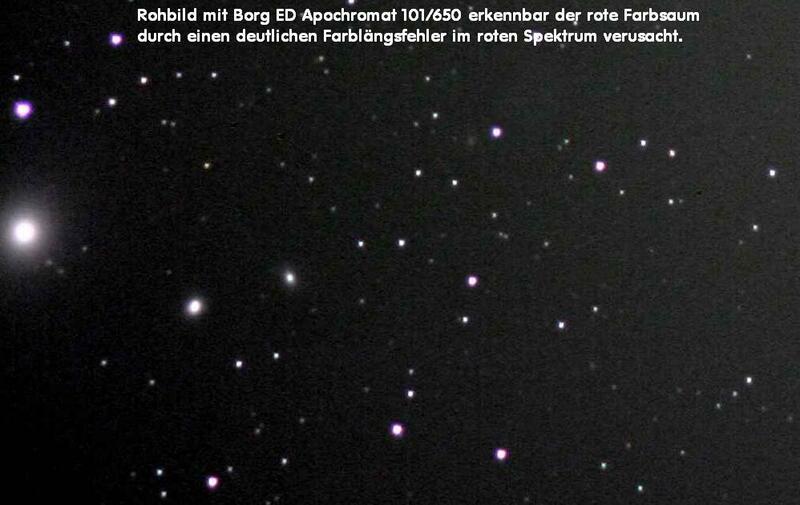 Aufgefallen ist es mir auch an den Foucaulttestbildern der Takahashi FS Apochromate und unterm Himmel. Wie kann ein APO mehr Farbe mit einem besseren W-Wert haben, als ein APO mit einem schlechteren W-Wert? Auch ist es aus den Diagrammen der Hersteller wie z.B. 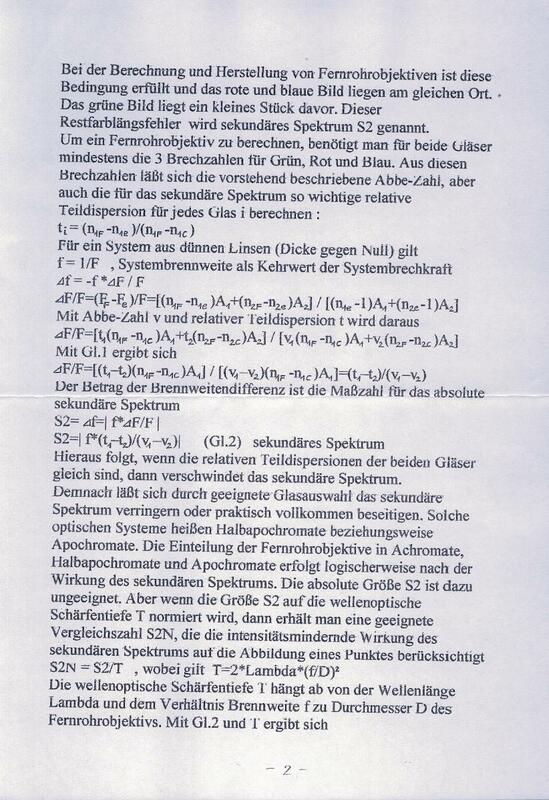 Sphärochromatischenlängsabberation und Spot der FS und TMB Apochromate zu ersehen. So scheint die Methode der wellenoptischen Schärfentiefe nicht mehr dazu geeignet zu sein, um weitere und feinere Abstufungen innerhalb des Apokriteriums unterscheiden zu können! Oder man führt neue Begrifflichkeiten mit neuen Maßstäben ein, wie z.B. der Super-Apochromat? Beziehung zum Farblängsfehler zu setzen, halte ich deswegen meßtechnisch für falsch.
" ....Den Farbeindruck direkt in Beziehung zum Farblängsfehler zu setzen, halte ich deswegen meßtechnisch für falsch." bzw. komplexe Betrachten von Sternscheibchen am Nachthimmel zu schieben ist. Apos nimmt, die bisher vermessen wurden: Televue TV102, Takahashi FS-102,TMB 100/800 und Zeiss APQ 100/640, dann hat beispielsweise der Televue einen Index-Wert von 1,2 der Tak 0,2 der TMB 0,3, der APQ ebenfalls ca. 0,3.
sich ziemlich gut mit deinen hervorragenden Abbildungen am künstlichen Stern: der Televue zeigt EINDEUTIG qualitativ mehr Farbsäume als der FS102, der intrafokal einen ganz leichten Blausaum, extrafokal einen leichten orangefarbenen Saum zeigt. Dieser wiederum zeigt geringfügig MEHR Farbsäume als der TMB oder der APQ. schon ziemlich überkorrigiert erscheint, während beim Televue kaum ein Unterschied zwischen der F,e,d, und C- Linie zu sehen ist. Die in diesem Fall logische Schlußfolgerung wäre also, daß die erhöhte Farbwahrnehmung zum größten Teil auf dem longitudinalen Farblängsfehler basiert, was sich auch mit dem hohen Index-Wert von 1,2 wunderbar deckt. am FS-102 etwas stärker. Der hervorragende W-Index von 0,2 des FS-102 bezieht sich ja NUR auf die Schnittweitendifferenzmessung, die im Verhältnis zur Tiefenschärfe gesetzt wird, das Thomas Back Kriterium bleibt hier ja total aussen vor, sprich, der Sphärochromatismus spielt bei diesem W-Wert (noch keine Rolle. Farbe ein Superapo am Nachthimmel zeigt. Sonst müßte -rein farblich gesehen (!) der TMB oder APQ W-Index BESSER sein als der des TAK. schlicht und einfach das Objekt der Begierde nicht so knackscharf und farbrandlos, wie es ihn ohne die Summe aller chromatischen Aberration sehen KÖNNTE. Bei Interferogrammen bitte immer auch die Wellenlänge angeben. Ich vermute, daß dieses IG bei 532 nm entstanden ist. Vielleicht kannst Du mir das IG zuschicken. Bei einem Refraktor interessiert mich sehr, in welchem Spektralbereich er sein Optimum hat und wie er im Blauen und Roten Spektrum aussieht. einstimmen. Beim Foucault-Test kann man das mit der Wirklichkeit sehr viel schlechter kontrollieren. als meßtechnisch diese Diagramme nachvollziehen. 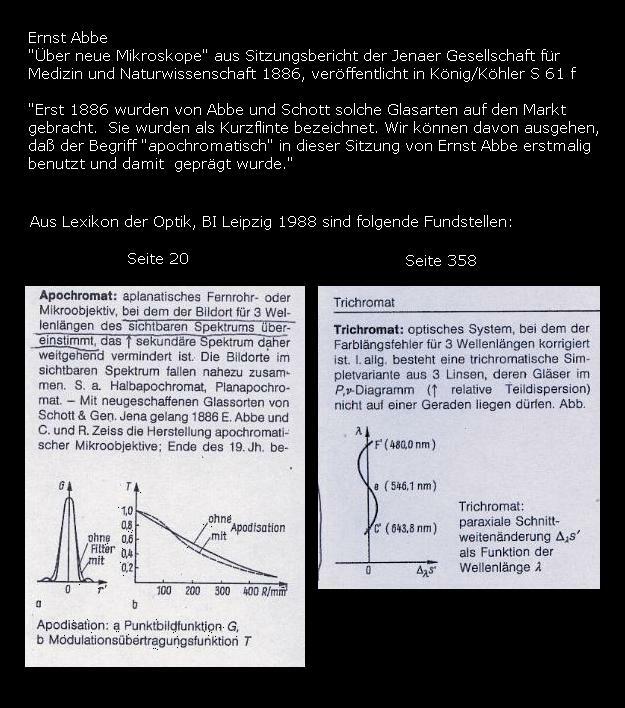 Index-Zahl verläuft also analog eines solchen Diagrammes im Bereich der 0.707 Zone, überlagert von Koma, Astigmatism. Nimmt man auch noch diese Foucault-Bilder, dann passen die analog sehr gut zu meinen Schnittweiten-Messungen. Die Indexzahl als Anhaltspunkt für die Auslesegrößen finde ich eine super Sache und ich finde es auch toll, das Wolfgang sich diese Arbeit macht! Aber es scheint doch so zu sein, dass die Zweilinser mit Fluorit als Linsenelement irgend wie nicht in dieses Schema passen!? Apochromate sind es auf jeden Fall!, doch scheinen Indexzahl und Realbeobachtung (Farbe) irgend wie nicht zusammen zu passen. 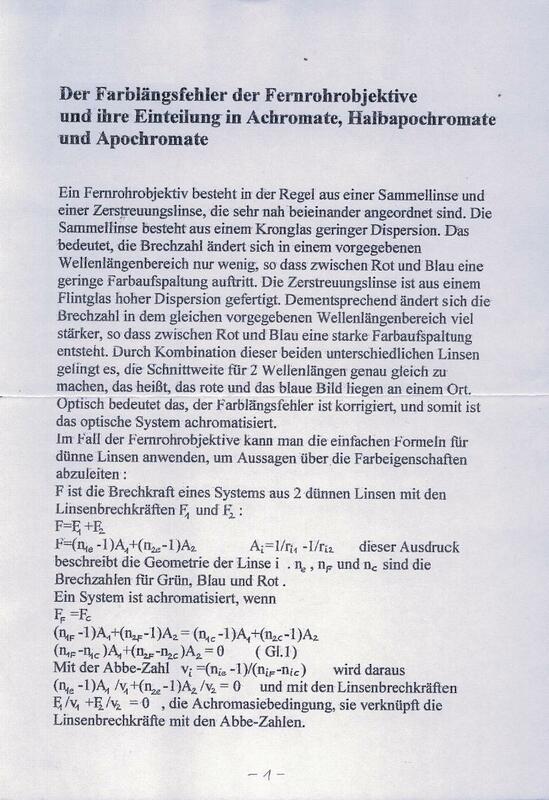 Sehe ich mir die Interferogramme der einzelnen Apochromate an, so scheinen die Interferogramme auch zu den Herstellerangaben zu passen. Alle Takhahasi FS sind im Blauen Spektralbereich Überkorrigiert und haben ihr Optimum im roten bis gelben, was so durch das Objektivdesign auch vorgegeben ist. So kann die Farbe Blau wenn in der 0.707 Zone gemessen gar nicht so nahe bei den anderen Farben liegen, nachzusehen im Daten Blatt des Herstellers. Entweder liegt dann für die FS-Serie ein Messfehler vor, oder die Indexzahl wurde anders ermittelt? Den wie gesagt, scheinen die Interferogramme der einzelnen Farben zu stimmen und die Herstellerangaben auch zu bestätigen. die Diagramme stärker auf ein Optimum zulaufen, liegen bei den Achromaten die Diagramm-Linien eher hintereinander. "Inkompatibilität" des Schnittweitenverfahrens mit den Fluorit-Doublets. von Takahashi nur die Werte für die optische Achse (also ganz unten), der 0,707 Zone bei h=36mm und dem äußersten Rand bei h=D/2=51mm (Werte ganz oben). 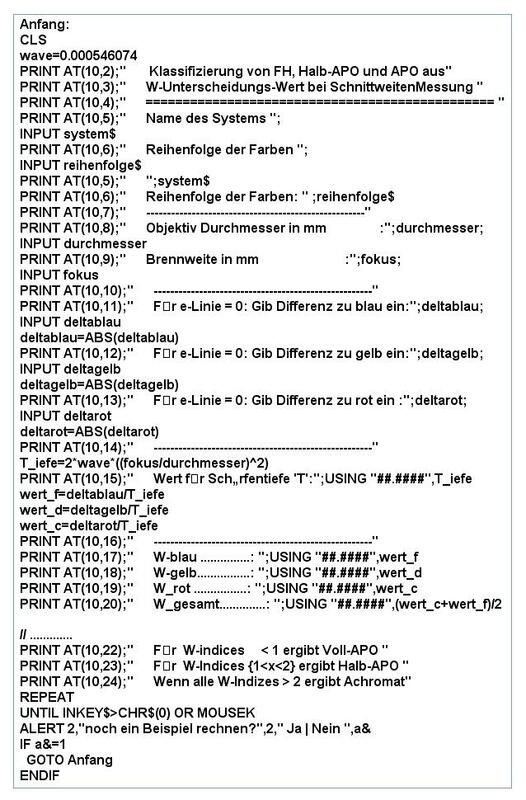 auf die F-Linie ja ziemlich gut mit denen des Diagramms überein. Mal ANGENOMMEN, der visuelle Eindruck bestätigt sich NICHT und auch mein FS-102 zeigt MEHR Farbe als der TMB, obwohl du (ebenfalls ANGENOMMEN) einen kleineren W-Index für meinen FS102 als für deinen TMB 100/800herausmißt. 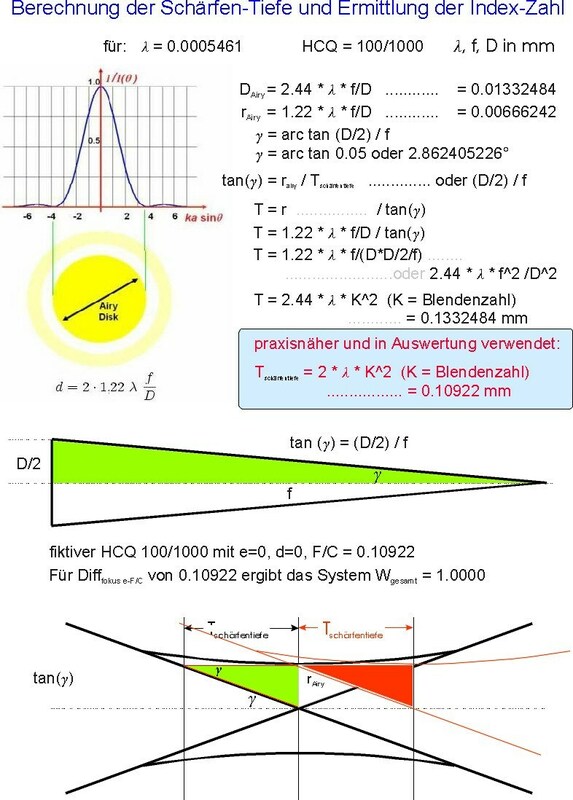 Diagramm, also auf der optischen Achse stattfinden würde. falls ich irgendeinen Gedankenfehler dabei gemacht habe? - modern (triplet) apochromats usualy have minimal amound of longitudinal false color, but a significant spherochromatism (which was NOT measured by Mr. Rohr's original method). Measuring only one of these aberrations (e.g. longitudinal false color) and not taking into account the others caused the contradiction between the observed amount of false color of apochromats and the measured parameters of Mr. Rohr. 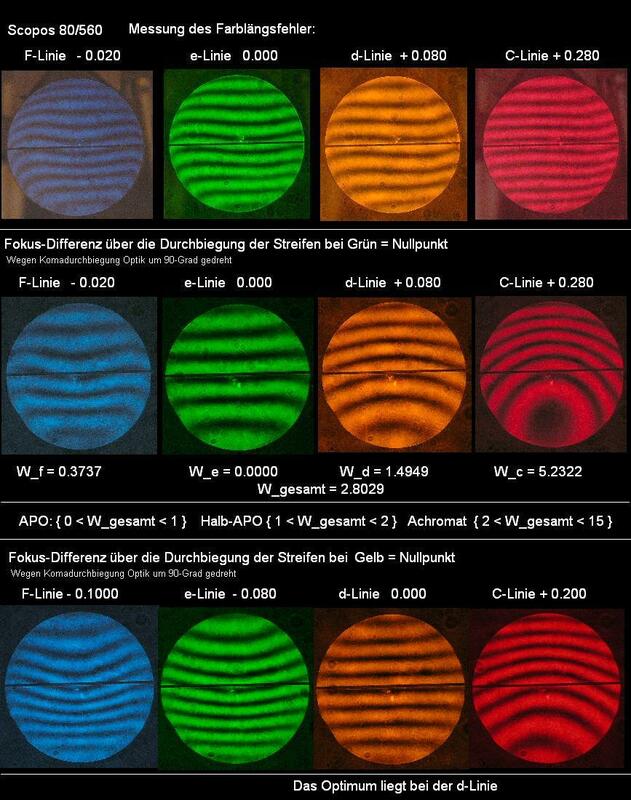 Unfortunately, measuring these aberrations one by one is not a good way, because in some lens designs, the longitudinal false color can partially correct the effect of spherochromatism, so, even if a lens have some amount of both aberrations, the final image can be extremely color free. So, for modern APOs, the good method is not to measure the aberrations one by one, but to measure their ACCUMULATED RESULTS, i.e. the decreasing value of the Strehl ratio in red and blue parts of the visual spectrum. But unfortunately, this method can NOT be used for doublet (ED) apochromats, because their Strehl ratios might be very near to zero in red and blue (depending on the design). At this moment I do not see much chance to design a "general APO false color index", that could correctly measure every lens type. 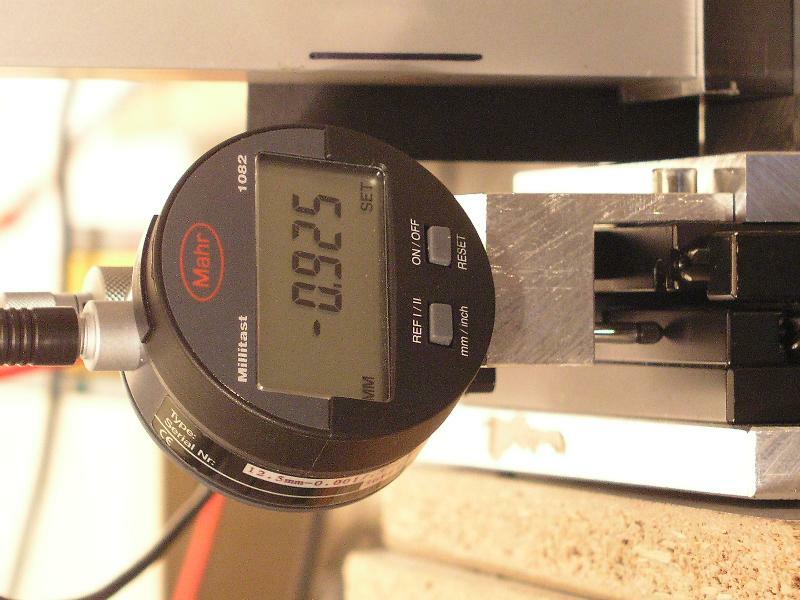 The direct Strehl ratio measurement is only good for real apochromats, and the cut-width method of Mr Rohr is well perfect for semi-APOs and achromats. But maybe this is not a serious problem, because Mr. Rohr performs both measuring methods professionally, just we have to learn how to interpret the results. And maybe we could use the new APO definition that I recommended some time ago, because the criteria given in that definition can be directly compared to the measured values of Mr. Rohr's interferometer. So, interpreting the results would be easy using that APO definition. deepness gets a long value as an f-ratio of about f/20. The higher the zone the better you'll see the color influence. quantitativ integral method and express the Gauss error with PV and Strehl values of over/under corrected. and you cannot show the value of the Gauss error by PV- and Strehl values. with this method you have no scale for all other types of refractors. the longer spectrum undercorrected and the optimum should be in the 0.707 zone. This would be the theorie. shows, this is not a Apochromat, but it shows no more. my laboratory. I'm sure it would be very intersted for all. By the way: My Synta achromat 150/1200 has a secondary spectrum of e = 0, d + 0.075, C + 0.640, F + 1.040. Index is 0.8546 and this would be an APO.